Betty Jane (Smith) Lenhart, 93, a resident of Golden Heights, Irwin, died there Friday June 1, 2018. She was born June 10, 1924 in Chattanooga, TN, a daughter of the late Martin and Jane (Boran) Smith. 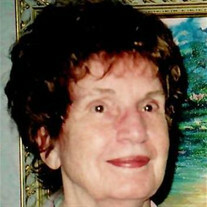 Betty was a faithful church goer who loved music and dancing and had an extreme love for nature. She enjoyed oil painting and was a member of the Norwin Art League and was well known for her sense of humor, and sweet and pleasant disposition. She worked for a number of years at the former Cox’s Department Store, Norwin Shopping Center. She is survived by her children Susan Lee Hill and her husband Jeffrey of Irwin and Debra Jane Lenhart of Coolville, OH; a sister Billie Elms of North Huntingdon; nieces Jana Kay Elms and Paula Carr; and great nephews Ian Elms and Travis Carr. Friends will be received from 2 to 4 p.m. Sunday June 10, at the William Snyder Funeral Home, 521 Main Street, Irwin, 724-863-1200, where a memorial service celebrating her life will follow at 4 p.m. with Pastor Terry Erwin, officiating. For online condolences please visit snyderfuneralservices.com. To send flowers or a memorial gift to the family of Betty Jane Lenhart please visit our Sympathy Store. "Edward J. Revak, Jr." || "Robert Lamont Hill"